Newport's most famous attractions are the mansions where America's tycoons spent the summer season in the last part of the 19th century and the beginning of the 20th century. The Breakers is the best known of these Newport cottages and so cruise ships calling in Newport always offer at least one tour going to The Breakers. However, another mansion that is often on the shore excursion list is Rough Point. Rough Point was the summer home of heiress Doris Duke and was used as a home until the end of the 20th century. As such, it has a more recent history than some of the other mansions that are open to public view. Furthermore, Ms. Duke left a substantial endowment for the preservation of this house and its contents, which are often museum class. The house was built for Frederick K. Vanderbilt in the late 1880s, replacing two smaller wooden houses that had been on the property. The new mansion was built of stone and its architectural style inspired by the manner houses that were the traditional home of the English aristocracy. Vanderbilt sold the property to William Leeds in 1906 and in 1922, Leed's widow sold it to James B. Duke. Jame “Buck” Duke had made a huge fortune. He was one of the first cigarette manufacturers to use a machine to roll cigarettes and was soon manufacturing half the cigarettes sold in the United States. His American Tobacco Company grew to become a monopoly and was broken up by the Supreme Court on antitrust grounds in 1911. However, by then, Duke had developed other business interest, most notably, the Duke Power Company, the forerunner of today's Duke Energy, Inc. He was also a philanthropist and his generosity to North Carolina's Trinity College led the school to change its name to Duke University. Duke had a mansion on Fifth Avenue in New York City (today it is New York University's Institute of Fine Art) and a large estate in New Jersey, Duke Farms. However, Newport was still the fashionable place for America's rich to spend the summer and so Duke wanted a house in Newport. 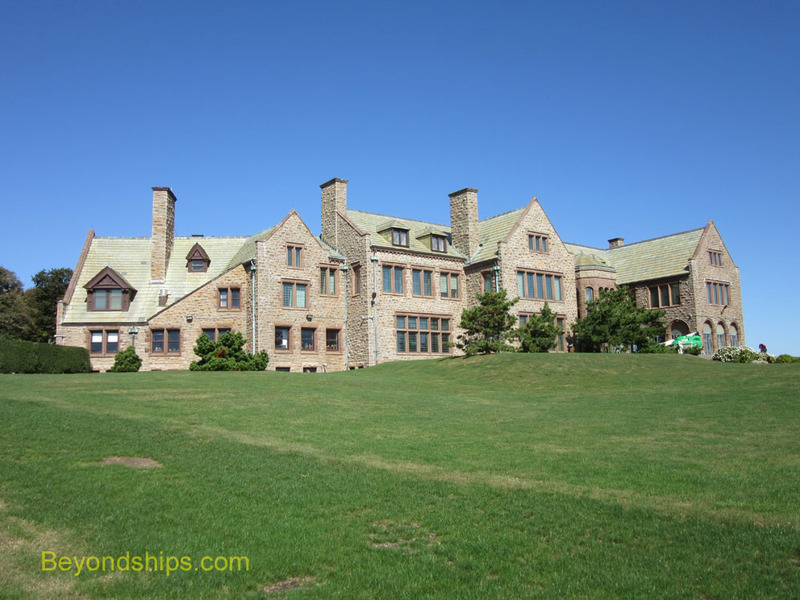 However, he wanted a larger house than the one Frederick Vanderbilt had built so he embarked on a program of expanding and refurbishing Rough Point. This included adding two wings to the house. The additions were completed in 1924, the year before Buck Duke died. The bulk of his fortune and property were left to his 12-year old daughter Doris. She continued to spend her summers at Rough Point until she married in 1935. Her mother continued to live there but after the hurricane of 1938, her stays became less frequent. In the early 1950s, she took most of the contents with her when she moved full time to New York. Rough Point stood largely unused for several years until Doris returned in the late 1950s. She began to re-furnish the house buying museum quality paintings and decorations. Rough Point became one of her chief bases of operation until she passed away in 1993. 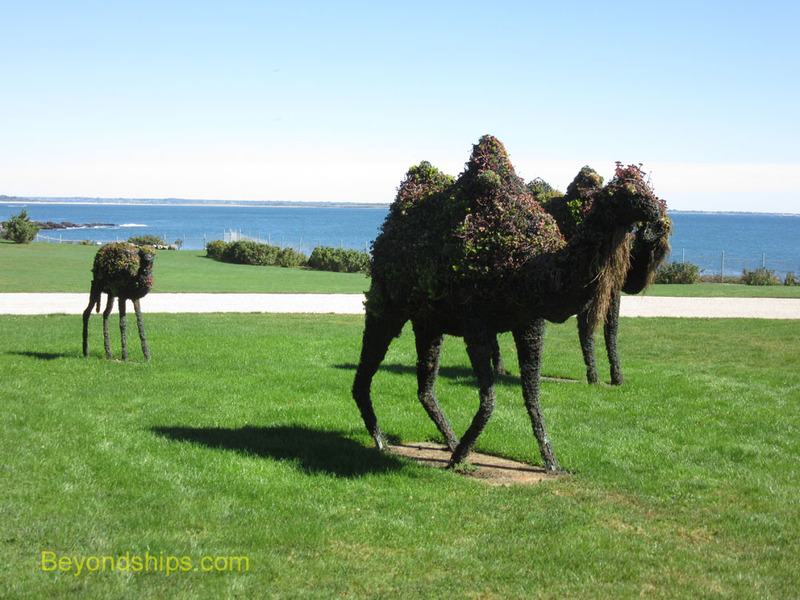 Above: Topiary camels are a reminder that Ms. Duke had a pair of pet camels who roamed the grounds of Rough Point during the summers. 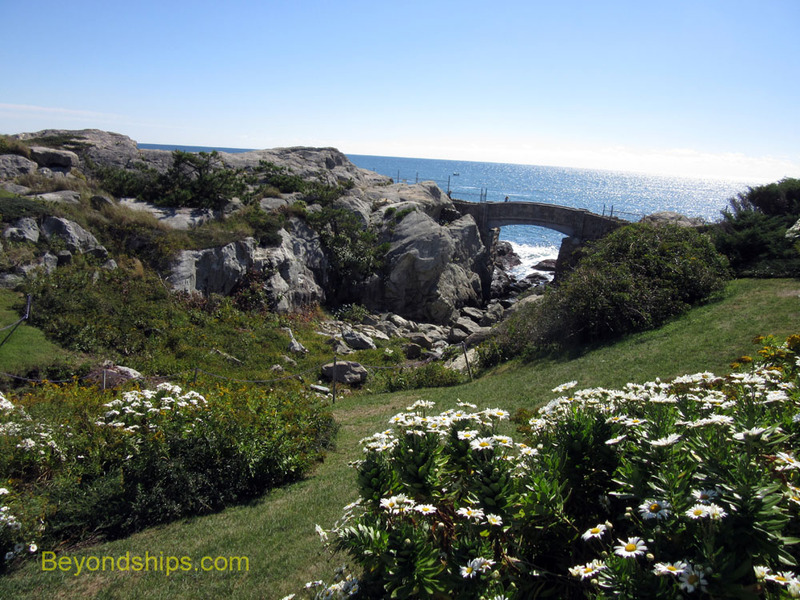 Below: The grounds in the back of Rough Point include a gorge that leads out to a rocky point. From the moment that she inherited her fortune, Doris was a celebrity and her life was chronicled in the newspapers of the day. After her death, several books and a television dramatization were released about her life. The reason for all this attention was that Doris led a colorful life. She was a world traveler, a journalist, a philanthropist, a musician, an art collector and a fashion leader. She was married and divorced twice and is rumored to have had affairs with people as diverse as actor Errol Flynn and General George S. Patton. Her friends were similarly diverse including Jacqueline Kennedy and jazz greats Duke Ellington and Louis Armstrong. Doris had several homes. She spent much of her time at Duke Farms but also had homes in Manhattan, Hawaii and Hollywood. To travel between them, she bought a Boeing 737 and had the interior decorated like the interior of a house. Rough Point is very much her house. Everything has been left the way it was when she was living there. As a result, visiting Rough Point is not like visiting a museum, it feels like you are walking through someone's home. You explore the interior of Rough Point via a guided tour. In addition to telling the history of the house and pointing out the works of art, the guides relate stories about Ms. Duke's life. For example, along with priceless antiques and museum pieces, Ms. Duke also collected large dogs. These had the freedom of the house and could go where they wanted regardless of Rough Point's treasures. During the annual Newport Jazz Festival, Ms. Duke would invite the artists to Rough Point. An accomplished jazz pianist and gospel singer, she would jam with them until late at night. Clearly, Ms. Duke was not stuffy. Leaving Ms. Duke aside, visiting Rough Point is interesting because of the art that is housed there. Many of these works by the great British portrait artists of the 18th and 19th century including Gainsborough and Reynolds. There are also works by Renoir and Van Dyck as well as Renaissance and Asian pieces. You rarely encounter this type of quality in a private house. The different rooms have been tastefully decorated. Many of the houses in Newport were decorated with items that had been brought back from the palaces and stately homes of Europe. However, at Rough Point, these items have been arranged with restraint so as not to be overwhelming or vulgar. I noticed that looking through the doorways from one room to the next was often like looking at a framed still-life painting with each item placed so as to be visually appealing. Visitors should not overlook the grounds of Rough Point. These were originally laid out by Frederick Law Olmsted, the designer of New York's Central Park. In the back of the house, the rolling lawn leads up to a rocky headland. Here, the waves crash against the rocks the house its name. 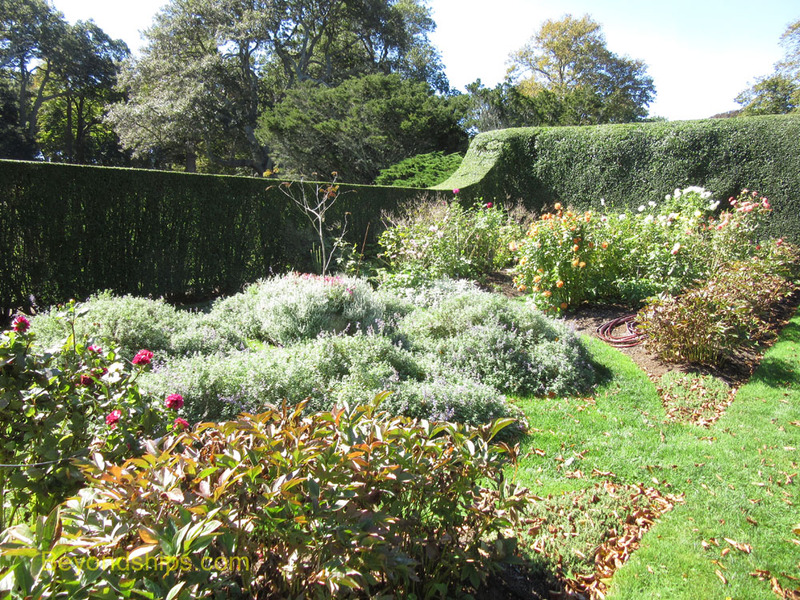 There is also a formal garden and a kitchen garden. On the return trip to the ship, the bus goes down Bellevue Avenue passing many of the other Newport Mansions. It is not a long ride as the pier where the cruise ship tenders dock is only a few miles from the mansions. Indeed, if you are a good walker, the journey can be done on foot.